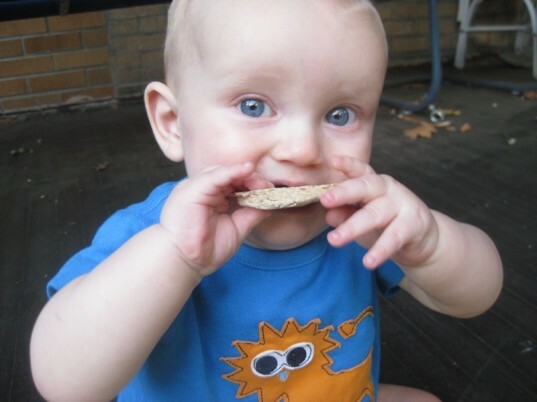 The American Academy of Pediatrics (AAP) recommends offering firm objects for teething tots, such as teething rings or unsweetened teething crackers, but to avoid frozen teething rings as the cold can cause additional injuries. Parents may wish to research other natural remedies for teething, or check out some of the eco-friendly teething toys we’ve covered in the past. The U.S. Food and Drug Administration (FDA) has issued a warning cautioning parents against the use of homeopathic teething tablets and gels for babies and toddlers. Brands highlighted in the warning include homeopathic teething tablets and gels under the CVS brand, Hyland's, and "possibly others." The agency is currently investigating reports of seizures in association with the use of these fairly common remedies, which contain compounds not regulated by the FDA. Hyland's posted a response to the FDA warning on their website which includes the following statement: "Hyland's Baby Teething Tablets have safely treated the pain associated with teething for more than 85 years. There is NO scientific link between homeopathically-prepared belladonna, or Hyland's Baby Teething Tablets, and seizures. In fact, the first symptom of an overdose of homeopathic belladonna would be dry mouth."